The shopping center has plenty of parking. Our store is located on the first floor on the Northfield Road side of the building. West Northfield Road and South Livingston Avenue. 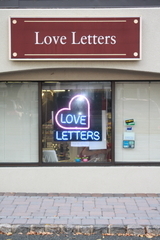 Love Letters is an established candy/gift/novelty shop in Livingston, NJ for over 20 yrs. Owners, Pat & Jeanette Montefusco, are proud to service their community.